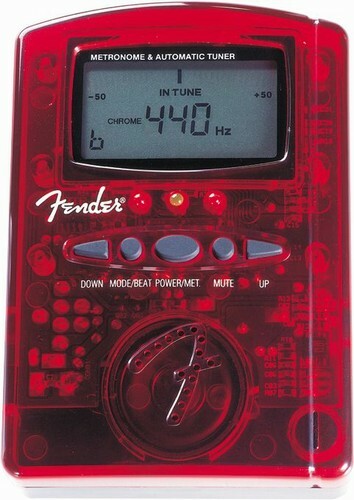 The easiest way to tune a guitar is with an electric tuner. I own about twenty of these, and have them spread out all over my house, office, guitar cases, and vehicles. My favorite one by far is the Fender MT-1000, shown below, it's cheap, has a metronome, signal generator, a 1/4" jack, and a mike for acoustic guitars. An electric tuner is great for the intermediate player on up, or for quick tuning, but I highly recommend tuning by ear for the beginner as much as possible. You'll actually learn to recognize the six open notes of the guitar much faster. To tune a guitar, an electric guitar, with the electric tuner, simply plug the tuner in, pluck the low E, tune, then repeat. Always remember to tune up, if your string is sharp drop it down below tune, and tune up. Also recheck the first strings tuned if your guitar was way out of tune, you'll notice that the low E and A may have sharpened a bit. Let's look at the following example of why tuning by ear could be important: So you’re camping with your honey out in the middle of the woods, and you’d like to sing some romantic songs to her. You pop open your guitar case, that you dragged through the woods for four miles, only to find that the high E string has suddenly snapped. You of course never go anywhere without backup guitar strings. You restring your guitar, and then reach for your electric guitar tuner, only to find out that the battery is dead. So there you are, stuck in the woods, with your honey, and nothing to do but talk to her. You're wishing you found this article on how to tune a guitar sooner. well don’t fret, no pun intended, there is a way to tune a guitar to get you by, and avoid all that talking. First, take a deep breath, close your eyes, and strike the open low E string. If you’ve been playing for a while, and have been tuning every time you pick up your guitar, as you should, that open low E should be ingrained in your head. Once you get the open low E as close as you can, fret the fifth fret of the low E gently, don’t press down any more than you have to, to get the string to sound cleanly. Now strike the open A string, and the fretted E (A). The two notes should sound the same; if the Open A is sharp tune it down, if its flat, tune it up. (As a rule you only want to tune up from a flat, if the string you’re tuning is sharp, drop it down below it’s intended pitch, then tune up). When you get close you’ll notice a pressure wave pulse. Meaning there will be a sound, when both strings are hit simultaneously, that pulses up and down in volume, as the two strings sound together. You want that pulse to disappear. If you turn the tuner, and the pulse gets faster, your going the wrong way. Essentially what you’re doing is eliminating the phase difference between the two pitches. Repeat this process between all of the other strings, except the G and the B string; I’ll explain further down. Once the A is tuned, tune the open D by fretting the open A at the fifth fret. Tune the open G by fretting the now tuned open D at the fifth fret. Now tune the open B, by fretting the open G at the fourth fret. We do this because the G and the B are only three intervals apart, where all other strings are four. Now finally tune the open high E by fretting the open B at the fifth fret. If you are someone who likes to camp, or just be away from civilization, you can tune using a tuning fork. Be your own free tuner I say, you can purchase tuning forks in a number of different pitches, you can even tune your guitar by stealing grannies middle C piano tuning fork. Remember, the trick about how to tune a guitar by ear is getting one string right. It really doesn't matter which string you start with. If you tune the open A with a fork, you can the tune the low E from A, and then D through high E as described above. 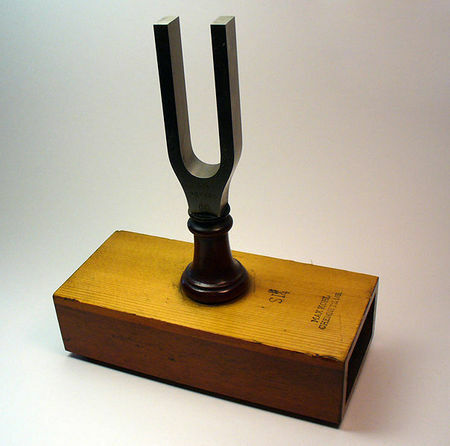 A tuning fork is a good thing to have around, and it doesn't need batteries. Thanks for reading how to tune a guitar, JB.